New research from Emory University School of Medicine, in Atlanta, has shown that it is possible for some information to be inherited biologically through chemical changes that occur in DNA. During the tests they learned that that mice can pass on learned information about traumatic or stressful experiences – in this case a fear of the smell of cherry blossom – to subsequent generations. According to the Telegraph, Dr Brian Dias, from the department of psychiatry at Emory University, said: ”From a translational perspective, our results allow us to appreciate how the experiences of a parent, before even conceiving offspring, markedly influence both structure and function in the nervous system of subsequent generations. The researchers now hope to carry out further work to understand how the information comes to be stored on the DNA in the first place. They also want to explore whether similar effects can be seen in the genes of humans. Professor Marcus Pembrey, a paediatric geneticist at University College London, said the work provided“compelling evidence” for the biological transmission of memory. 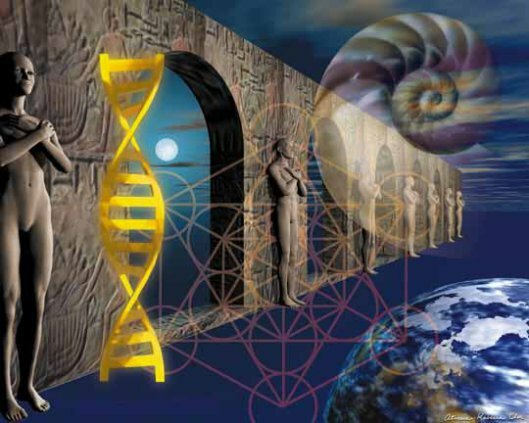 May our DNA Carrying also spiritual and cosmic memories passed down in genes from our ancestors?